I hope you had a wonderful Easter weekend! 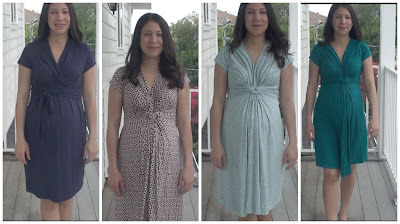 This week I have my maternity ten-item wardrobe for you. Today's video combines both the fashion show and the commentary. My ten-item wardrobe is actually comprised of nine core items instead of ten: six dresses and three skirts. I wear maternity tee shirts with the skirts. The tee shirts are filed in the "extras" category. As you can see, my maternity wardrobe is very simple. I live in a hot climate (Southern California) so dresses and skirts are the most comfortable for me. 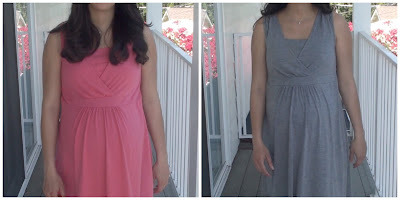 I was in need of dresses that could be worn either casual or dressy, and the Seraphine dresses are the perfect choice. For more casual, summery looks, I have the two sleeveless dresses as well as the three skirts (two long, one short) from Old Navy maternity. 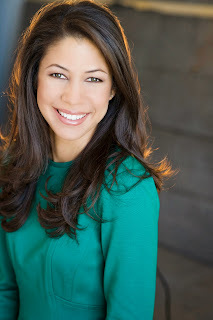 Check out my interview with Kimberly Wilson of Tranquility Du Jour. We discuss Polish Your Poise with Madame Chic and so much more. Just stumbled upon this video. Just wanted to say thank you and I agree. I'm soooo tired of seeing ladies (and some men) walking around in pajama pants! They're shopping at the local grocery store, Target, the mall almost everywhere in pajamas! Have we really gotten to the point as a society that we don't even care if we put on clothes??? Have we gotten so comfortable with dress down day that we have forgotten how to dress up? Somebody PLEASE bring back real clothes! Glad I saw this video thought I was the only one concerned about our lack of dressing these days. Hi JoiSharpe, I feel your exasperation! I think our society has slowly become accustomed to people dressing this way, so for many people it is no longer shocking. Luckily on The Daily Connoisseur you have found a group of people who tend to agree with you. Jennifer, thank you for the vinegar & water cleaning solution idea (I left out the lavender as I didn't have any on hand but am considering adding an essential oil for next time). I went on a Spring cleaning rampage this past week and noticed that the Method all-purpose cleanser I was using just didn't get the job done. Switched to vinegar & water which was much more effective! I even used it to clean our glass shower doors and it was so simple, took less than a minute and left them sparkling clean. Hi Unknown, I love the vinegar/ water/ lavender cleaning solution too. I use it every single day. I will be sure to do a video tutorial on how I make it in the near future. Morning! That's our plan for our slipcovered couches. Do you air dry the slipcovers? Iron before replacing on the couch? My grandma always kept her sink full of soapy water, too. I need to start doing that too. Thanks for the reminder! Hi Marie, we air dry our sofa slipcovers. I would not recommend putting them in the dryer as they could shrink and no longer fit on the cushions. Ironing would be a special touch, but we do not iron ours. As for the soapy water in the sink, I love it! Just be sure to rinse the suds off before placing the dishes in the dishwasher so as not to clog the machine. I hope you enjoy my maternity spring/ summer ten-item wardrobe. Even if you are not expecting, you can benefit from seeing how a ten-item wardrobe is put in place. Be sure to leave a comment below. I love to hear from you and you might be chosen as comment of the week! FTC: All items featured in this video were purchased by me. All opinions are on my own. Part two of the Q&A video resumes today. I answer Marisa K's question on what to do if you were not taught chic behavior in childhood and how to shake self-consciousness with developing poise later in life. I also answer Basia S's question on how to find quality girl friends. An important note from last week's video that I wanted to mention, regarding my sink full of suds tip: make sure you rinse off the suds from your dishes before placing them in the dishwasher so you do not clog your machine. Thank you, Ellen G., for this reminder. Hey There. I'm a Canadian, (North Eastern Canada), living in the US for the past 13 years. I just came across your YouTube channel and your books, blog and everything this past weekend!!!! Oh serious joy!! !Right away I started my closet purge. Still a work in progress. Working on my 10 piece S/S wardrobe. I too simply love to wear dresses. And yet have I done that in recent years ...... No! I've asked myself why, finding I have no good reason why. So, as soon as I happened upon your channel and I saw the very pretty dresses, I did a happy dance. It hit me. There's my honest to goodness style. The one I should be true to. And so I've begun. Hi Wanda, I am so happy you have embraced your true style and are now enjoying wearing the clothes you love. Wonderful! Hi Tina, thank you for your testimonial! I love to hear the exciting changes that take place in people's lives after implementing the tips from the book. Today I would love to know your thoughts on the topics discussed in the video. Do you have any tips to add? Any questions to discuss? How do you find quality friends? Have you dealt with self-consciousness with developing a chic lifestyle? I hope you have a wonderful Easter weekend. I will see you next week for my maternity ten-item wardrobe. See you then! What is the homemade cleaning solution I use in the video? How do we make white sofas work with small children in the house? What are the benefits to having a sink full of suds? I also answer some frequently asked jewelry questions. Important tip: Be sure you wash the suds off the dishes before placing them in the dishwasher. This will prevent your machine from getting clogged. I am a guest on Kimberly Wilson's Tranquility Du Jour's podcast, this time discussing Polish Your Poise with Madame Chic. It's a nice, juicy interview. Be sure to check it out! Over50Feeling40 shares my what we wear matters video in their article, What We Wear Over 50. Raised in the world of music, I was trained and led by example to always present myself well as a form of respect. I have certainly been through phases of not doing so at times. During University, I recognized that the students in the College of Fine Arts were always well dressed. At first I thought I was just seeing a display of artistic students who loved fashion. However, I realized that the music/art/architecture students were immersed in a culture where our professors mattered to us. They were our mentors, people who had put decades into mastering their craft so that they can be great teachers of their art. I was required to dress presentably for my private lessons and for any setting that I may be performing, even a rather informal small gathering. My private instructor would often give mini lectures on the importance of dressing appropriately. Though dressing well for my lessons started as a requirement, it morphed into a habit that said, "I respect you and your dedication to teaching me, and I am ready to learn." Now, as a teacher myself, I know that dressing well for my students says, "I care about the important work of sharing this art with you, and I'm here to do my best." * On a side note - As a child I would begin my lessons with my teacher by bowing to each other - my teacher would say "I am ready to teach," and I would respond, "I am ready to learn." I still look back on that as a way that I was taught to respect my mentors. Hi Johanna, I absolutely loved your comment on the importance of dressing well. It is a form of respect and it does matter. Thank you for sharing your story with us! I often get asked if it costs anything to subscribe to my YouTube channel. The answer is no, it's free! When you subscribe, you can have the option of being emailed when a new video shows up. This is optional. To visit my YouTube channel, click here. I will see you on Thursday for part two of the Q&A video, where we discuss finding quality friends and the correlation (or lack thereof) between money and class. See you then! You gave great advice on the exhaustion! Cutting way back on activities and expectations, getting tiny little rests (I would rest on the sofa while my children played around me--10-20 minutes of that gave me enough of a second wind for the rest of the day), going to bed *early* (when my daughter was a baby I went to bed at 8pm every night, because she was such a fitful sleeper! and I got up at 8 am when my 3 year old woke up), and thinking through the planning of essentials such as meals and laundry really go a long way. The season doesn't last forever, but it feels endless when you're sleep-deprived! Choosing a tiny, kind thing to do for yourself each day is also helpful, in my experience. A hot bath, some time to sit and knit, fresh air, 20 minutes to read a book, sketching or writing for a few moments...these were all small refreshers that I took when my children were very tiny. Just a few minutes of some small investment in your own creativity or peace of mind makes you feel so much more human and energetic. And it does get so much easier! You just cannot do it all when you have young children...and that's okay. Choose the best and the rest will fall into place! Hi Polly, you give wonderful advice. I agree that investing some time in yourself each day is essential to recharge your battery. Thanks for the great comment! Believe it or not, I am 44 years old and you just taught me how to apply makeup. Most videos of this type are just far too complicated and I don't have the attention span nor the time to apply make up in such a complicated fashion. Thank you so much! Hi Latonya999, I love this! Sometimes you just need to see someone else's routine to get inspired to do your own. Thank you for joining me this week. I hope you have a wonderful weekend! See you next time. Thank you for your great response to yesterday's kitchen tidy video. Today is a quick family room tidy. Depending on how much energy I have at the end of the day, I usually tidy up the family room before I go to bed. But we have all had those days when we leave it until the morning. Please note: this is not a deep clean video. In deep cleans, the rug is vacuumed, floor mopped and all surfaces dusted. Join me as I plump and fluff and dust the family room. And be careful that the paper airplane does not hit you at the end of the video! Jennifer . . . thank you for your books and insights! In today's world of "lewd, crude and rude" your books and videos are a ray of sunshine! Hi Sunisteph, thank you for sharing your memories of your father. How wonderful that he made you a tartine every day. I love that he has maintained a morning routine even after retirement. Glad to see I'm not the only one putting on an apron (yours is a very pretty one I might add) and rubber gloves ! I would like to know what product you are using to spray on your counters. Thanks for showing that just putting in a few minutes to clean up and put things away keeps things under control at home. Hi Toinette, I am using the vinegar/ water/ lavender cleaner I provide the recipe for in At Home With Madame Chic. I can do a future video showing this recipe if there is interest. Thank you! Today I would love to know... how do you tidy your family room? Do you do this on a daily basis? Do you find that toys and other stray objects find their way there regularly like I do? Let us know your story in the comment section and you could be chosen as comment of the week! I hope you enjoyed yesterday's Make the Bed Inspiration post. In yesterday's comment section, Daily Connoisseur reader, Daesman, shared an article about Admiral McRaven, a retired Navy Seal. Admiral McRaven explains at a University of Texas, Austin commencement speech why it's important to make your bed every day. "If you make your bed every morning you will have accomplished the first task of the day. It will give you a small sense of pride and it will encourage you to do another task and another and another. By the end of the day, that one task completed will have turned into many tasks completed. Making your bed will also reinforce the fact that little things in life matter." Today we are doing a quick tidy of the kitchen. This is not a deep clean video, I am just tidying up after breakfast, so there is much less to do! For every meal, I like to have some warm soapy water in the sink that I can drop the dishes, pots and silverware in. This helps break up any food left on them before I place them in the dishwasher. I find that this actually uses less water than if I ran the sink for each additional item. Hi Jamie, I'm so glad you are having that great feeling every day now. Thank you for sharing your enthusiasm with us! My mum always said, "Make the bed, wash the breakfast dishes, sweep the kitchen floor, throw out the papers & straighten the lounge. If you do nothing else, the house will appear in order. Hi Kerrie, I love your mother's advice! A quick tidy every day does wonders and doesn't take as long as we think it will. Hello! I was wondering if there was a way to subscribe via email to your blog updates. I only saw a feed but not a subscribe button for email. I am a big fan of your books and would love to get blog updates to my email, if that is possible. Hi Lori, Half way down on the right side of the blog, you can subscribe via email. Enter your email address in the space provided and you will be subscribed. I believe you need to also check your email and click confirm to receive the emails. Thank you! Today I would love to know... how do you tidy your kitchen after breakfast? What is your routine? This is going to be a fun week on The Daily Connoisseur! I have four videos for you, starting with today's video, where I make the bed. Many people have been asking for a home tour and these quick tidy videos I will release this week are a fun way to get a peek into our home. 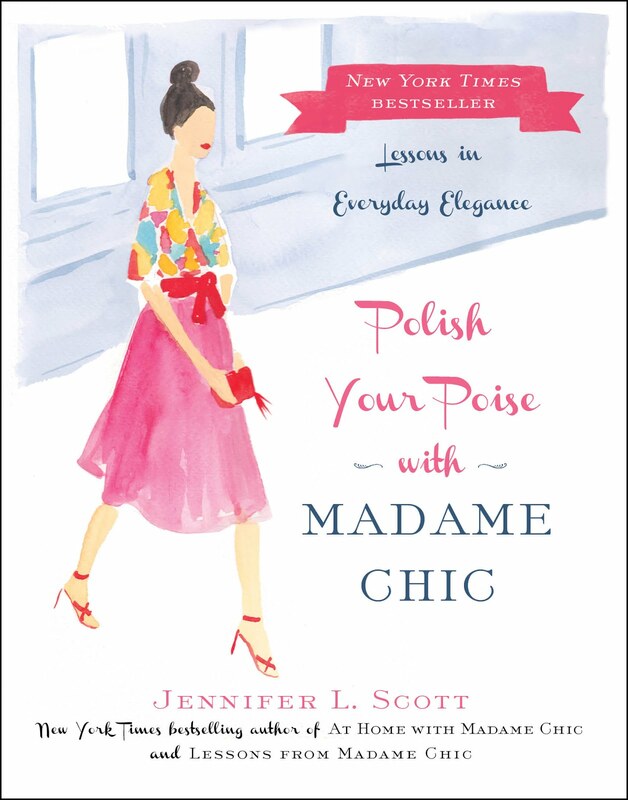 Over 50 Feeling 40 loves the posture advice in Polish Your Poise with Madame Chic. 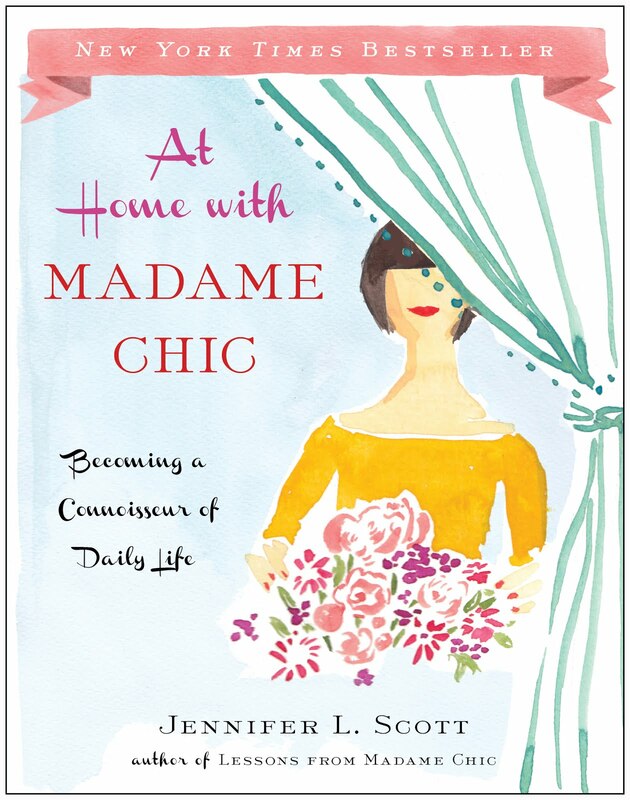 Tips on Life and Love lists At Home With Madame Chic as one of ten books to revitalize your spring closet. Jennifer, you are so very right about "you never know what your day will bring you." Something always comes up and I am always glad I have prepared myself for the day. Besides that if you don't get ready for your day it will seem like it never starts and you have wasted a whole day. I agree with you in that I always feel worse if I don't prepare myself for the day (which is why I have learned to prepare myself for the day starting the night before). It is so much more.....I just feel alive when I am prepared and presentable for my day. Starting the night before helps reduce the stress which can come with the morning as well. Thank you! Hi Mitzi, I agree that the day feels like it hasn't started until you get ready. Great comment! This week, I would love to know. Do you make your bed every day? Do you enjoy making it? What about the people in your family? Here are some of the YouTubers I mention in this week's video. Each of these ladies is very different to the other but they all do cleaning videos that get me motivated, and I find their personalities very endearing. Next week I will have three short tidy inspiration videos for you. I figured if I love watching the tidy videos on YouTube, I should create some myself! Be sure to check back to the blog regularly next week for updates. Lizzbert compiles her ten-item wardrobe, finally! 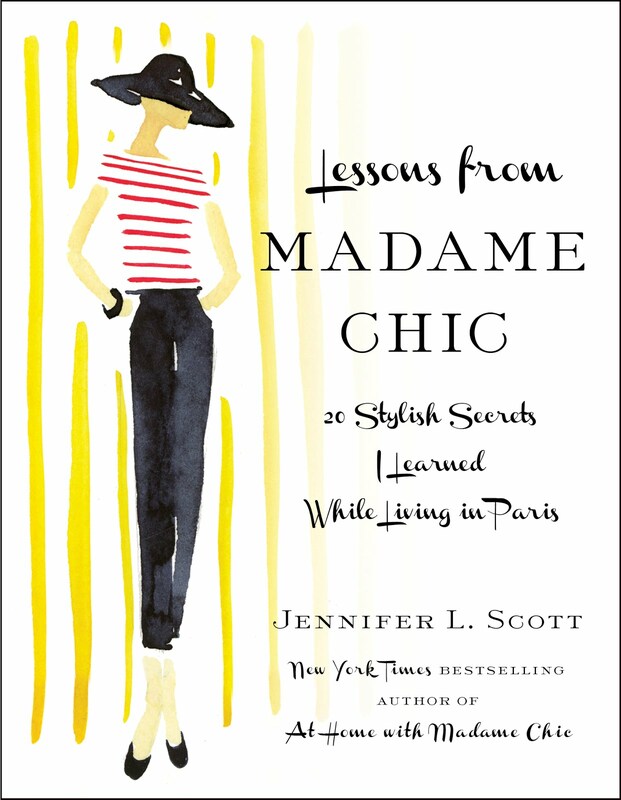 Displaced Nation lists Polish Your Poise with Madame Chic as the best of expat non-fiction for 2015. Love this video, especially how you talked about the peaks and valleys. My 3-year-old and 8-month-old are both going through some sleep issues and I am exhausted! But last week (and I'm continuing this week) my goal was to wear real clothes every day! No sweats and tee shirts. And while I'm still exhausted, I've found that I feel better and more productive! Hi Meagan, I feel the same way. When I am exhausted, I feel worse if I don't get dressed for the day. I'm glad to hear you are marching on! Your thoughts on every topic in this video - especially conversation amongst new individuals - are spot on. As appealing as "the ten secrets to perfect conversation" or "the fail-safe 25 conversation starters" might be, oftentimes we simply need to be self-assured in the sense that failure is perfectly acceptable and communication will always be a growing process. If we pressure ourselves into performing, by proving our identity as a witty conversationalist, than our minds will be consumed with this thought and this thought only, clouding any effort to engage honestly with someone. Humility and integrity are the necessary ingredients of a conversation. Hi Charitie, Thanks for another insightful comment. I agree, that if we are so worried about what we are going to say to someone, we end up missing the moment and not being present in the conversation. It's much better to just see how it unfolds and to not be afraid of silence. This week I would love to hear from you. How is your morning routine going? How do you deal (or not deal) with exhaustion? If you have any questions you want to ask me, please leave them in the comment section for a future Q&A video. See you next week as I make my bed and tidy the kitchen and living room. Oh la la!